Cameroon used a fake cannibalism video Mark Zuckerberg’s $430 bln outfit left on its pages to justify a military crackdown. 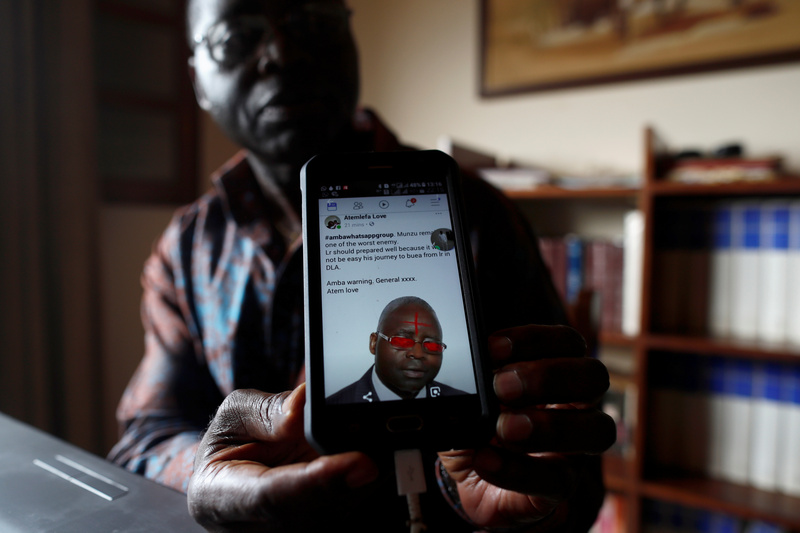 Facebook has not done enough to combat online abuse as social media booms on the poorest continent. But effective monitoring would hardly break the bank. Simon Munzu, a former UN official, who is campaigning for peace in the Anglophone regions of Cameroon, shows a threat message posted against him on social media by separatists during an interview with Reuters in Yaounde, Cameroon October 3, 2018. Picture taken October 3, 2018. A video falsely described as a Cameroonian rebel cooking human body parts appeared on Facebook in June, Reuters reported on Nov. 5. The video, which was debunked within a week of its appearance by local rights groups proving it was a movie clip, was used by a government minister in the former Franco-British colony to justify a military crackdown against Anglophone secessionists. Hundreds have been killed and thousands have fled Cameroon’s English-speaking southwest since a rebellion started in October 2016. Facebook said the video had not been reported by users and that it could not comment further on the clip, Reuters reported. The video was no longer available on the site by late October, it said.